Turkish flatbread or turkish pide is a flatbread bread which is healthy and can be accompanied with practically anything. Have it with a curry, soup, make it into a sandwich, top it with your favourite topping. Let your imagination run wild. 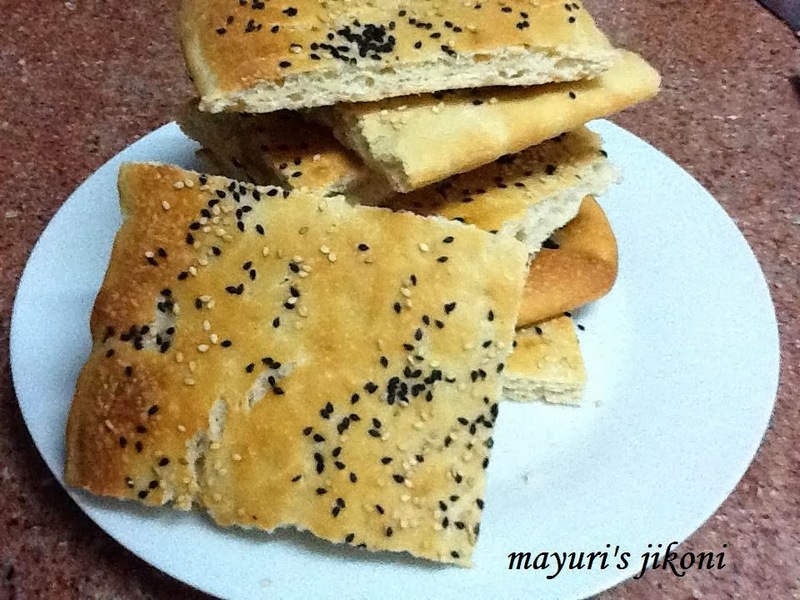 Its a chewy bread which can be shaped into a rectangle or oval shape and sprinkled with sesame and nigella seeds. Turkish flatbread is baked on a stone or clay slab but I baked it in a normal oven tray.Its also topped with cheese, vegetables, meat etc and baked much like a pizza as a quick meal. I served this bread with soup. The left over tasted great with tea the next day. Add salt, sugar and yeast to the flour and mix it. Form a dough using the milk water mixture. Sprinkle a bit of flour on the work top and knead the dough for 10 to 15 minutes till it is smooth and silky. Form the dough into a round ball. Rub oil all over the dough and the bowl. Place the dough in the bowl. Cover it with cling film and place it in a warm place. Let the dough rise for 1½ to 2 hours or till it is double the size. Knead the dough again gently for a few seconds. Grease a tray with 1 tsp olive oil. Place the dough on the tray (14″X 10″) and using your fingers spread it into a thin layer. Let the dough rise again for 30 to 45 minutes. Brush milk or egg wash over it. Sprinkle the sesame and nigella seeds all over the dough. Bake in the oven for 10 to 15 minutes or till the top is light golden brown. Take the bread out of the oven and let it cool slightly on a wire rack. Shape the dough into an oval or into 2 smaller rectangles. I used black sesame seeds also. Egg wash is 2 tbsp of liquid, either milk or water added to an egg and mixed.